Not everything in a translation project is exciting or especially interesting, but I figure it’s better to show progress than show nothing 😛 For the last couple days I’ve been working on a lot of the simpler hacking that needs to be done – in particular I’ve finished up the file load/select/create stuff. 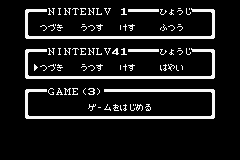 The original Japanese screen has very small windows, which wasn’t enough for all the English text to fit in. In fact, for EarthBound Zero they had to completely rip some stuff out. I decided it’d be better to just expand everything out to get as much room as possible. What took the most time was figuring out how to change all the cursor locations. I was also thinking of changing the text speed option here to have the easy/normal mode selection, but I realized it’d be a lot more trouble than it’s worth – I’d have to remove the text speed option from the battle menus, plus it’d completely take out an option that existed in the original. My plan now is to stick a gift box in Ninten’s room, and inside it will be the Easy Ring. I’m sure that’ll be tough, but it seems doable. Anyway, as I’ve been going along, I’ve been fully decompressing all these windows and blanking them out. 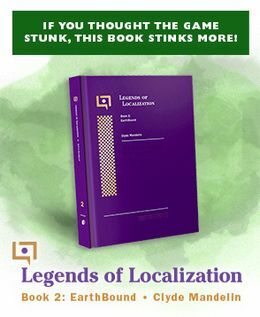 This will help make it super easy for people to translate the game into their own languages without having to redo all this annoying work themselves. I’m also planning on adding international letters to the font like we did with MOTHER 3, so with any luck we’ll see translations of this into other languages too! Next, I’ll probably tackle more of the various early screens, like the naming screens and the intro text. Everything fits nicely into the menu. It actually looks nicer than the original version, since the name and level are now separated by a few spaces. If you ever do go on a crazy extra feature hacking spree, you should figure out a way to add in different menu flavors. I think you should just leave the text speed permanantly on high And put the difficulty in where it used to be. I don’t know many people who pay attention to the text speed. FILE NAME LVL will vanish. OK? It just makes it seem like a better translation. The Jappanese got correct grammer, so why shouldn’t we? 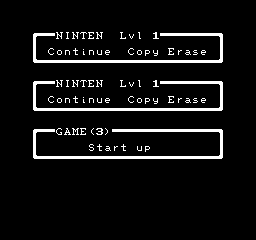 I think that the text speed should be left in cause then it leaves the chances for a slow text run like in earthbound. i don’t know if that would make it more challenging (since i usually leave the text on high as well) but i do know someones gonna wanna do it. but either way great to hear that everything’s coming together. I’d probably move the text speed up a line so it can fit, if that’s possible. What good is a slow text play-through in Mother? The HP doesn’t roll, so it’s not like text speed effects how much damage is taken, or anything. Thank you Mato for really taking the time and effort to really translate M1+2. I hope we can get one step closer to seeing it’s release. I just remembered another reason I decided not to do the difficulty on the file select screen – there’d be no way to choose the difficulty when starting a new game, so the option would probably go unnoticed by lots of people. KingMike: I can probably move it up, but it’d look pretty bad I think. Thanks for working on this, it sounds like you’re doing an awesome job on such an interesting project. Hm, Mato, do you think you can tell how much has been done already? Like a percentage or something? Very roughly I’d say the project is halfway done. There’s a lot of minor hacking, a little bit of major hacking, and then the polishing/testing phase. It’s an addition being added by Tomato. Will the maps be changed to their EB0 Names, and will the Title screen also have the name EarthBound Zero instead of just Mother? Last he mentioned it, he wants to keep the original town names, desert name, and train station name. Since the game’s called “Mother 1+2”, and since NoA and NoE called it “Mother” in Smash Brothers Brawl, and since he went with “Mother 3” for Mother 3, there’s about a 99% chance that he’ll keep the name as “Mother”. I very much want it to be called Mother, as Itoi intended. Mato, thank you again. I know it seems silly that these little updates would satiate anyone’s thirst, but I assure you I check this website every day specifically for little updates like these about the M 1+2 status. It makes the wait so much more bearable. Thank you! And thank you for doing this out of your generosity. climhazard: It’s an item I added, there’s a demo patch of it in an earlier update somewhere in fact. Andy: well when I say major, it’s kind of like in the sense of major vs. minor surgery. The stuff in this update is simple, minor cosmetic stuff. Some of the more complicated stuff is fixing up issues that arise from expanding the main dialog text box. What if you made it so when you press select or such over a file slot, it toggles Easy on and off for that slot? Assumedly either EASY would appear somewhere on the slot’s border, or it could turn blue using a color that would be available due to the extra GBA colors. 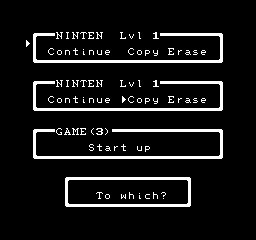 This would probably be something that could be done even before a file is started, just toggling the easy mode on a new file instead. It’s great to see some progress! I remember when we’d rarely get an update. Best of luck! Dinner Sonic: the problem with that is that it wouldn’t be obvious the option existed. 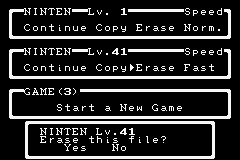 That’s why I was thinking of changing the text speed option or sticking a present in Ninten’s room, that way it’d be less likely that players would miss it. @Mato: Here’s something that could work. Do what Dinner Sonic says, but put a text box at the bottom saying “Press Select to switch game modes” when you’re not copying or erasing a file. My opinion is to put Easy or Norm above “Erase”, right between “Lvl #” and “Speed”. I would think to make the Easy Ring an item rather than an “option.” After all, if you don’t want to use it/hold on to it, you could always just give it to your sister to hold on to. The only thing that might be a problem is that you can’t unequip stuff once you do (unless I’m missing something,) so if there could be an option to unequip stuff, it would make things easier. @Qiezei: The only way to un-equip something to equip something else of the same type. Like by equipped another type of ring, you un-equip the Easy Ring. Say, I just got another idea! 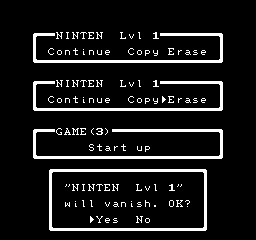 How about adding an option on the file select screen where the Easy Ring is put in Ninten’s basement! If that option is turned off, then in it’s place is some Bread. What do you think, Mato? I did a couple of edits of a pic describing my ideas. If you just kept the New Game thing thing the way you have it now, would that make it any easier? I don’t know what you mean by “new game thing thing”, but at this point I’m pretty sure I’ll either just keep the ring in the basement like it is now, or go through a lot of hoops to add a present to Ninten’s room. I think those are the easiest things to implement that will be less likely overlooked. 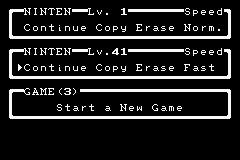 What I mean by “New Game thing thing” is the “Start a New Game” window. But yeah, I think adding a present to Ninten’s basement with the Bread that’s originally where the Easy Ring is is a pretty good idea. Either that, or when you start a new game, you can choose to have either the Easy Ring in the basement, or Bread. Exactly what I mean. If you don’t want the Easy Ring, you can replace it with the Bread that originally in there. I’m just so happy to see some continued progress on this patch. I can’t recall the last time I actually looked forward to a game’s release. I Don’t wanna sound like a purist when I say this but try not to make too many changes with mother. Just a little word of caution. Anybody else planning to do a play through of the entire translated series by Mato if this gets released? Personally, I plan on going the extra mile and port this game plus mother 3 to a GBA flash cart. Then, my dream of having mother 1+2+3 shall be complete. Anonymous: you’ll probably have to put them on two carts, since Mother 3 is already the maximum size a single GBA cart can be. Things are looking pretty sweet. I’m glad you came back to this. I know you have other things going on in your life and all, but i hope there isn’t gonna be another 1 1/2 year hiatus on this again. Also, are you ever gonna update the faq and to-do lists? Really? I put a patched Mother 1+2 AND the Mother 3 fan translation on my EZ cart IV… unless you were talking about another flash cart. psi wolf: Yeah, I don’t know how all flash carts work, so I supposed it’s possible for some to be able to hold both. Morgil: Yeah, I just keep forgetting to update it. Anyway, I just realized that the current top 4 posts (shown on the leftbar) are all M1+2 updates. Man, I guess I forgot (or didn’t realize) how excited people are about playing the first game in English even though English versions are already available. Mato: You can put multiple games on good flash carts, including some GBA ones (these usually use mini or micro SD cards). 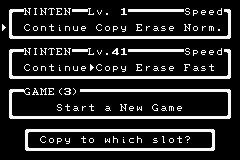 You can choose which game to run via a launch menu. I think the general way it works is that the ROM you choose from those flash carts’ launch menus is loaded into a RAM chip that presents itself to the GBA as ROM game data. 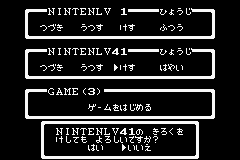 Now, combining Mother 1+2 and Mother 3 together into one ROM image would definitely be impossible, unless the GBA could support carts larger than 256 megabit and it simply was never implemented. Even if that was possible, I would imagine that trying to put Mother 3 into a combo pack would require a lot of effort. I plan on putting M1+2 and M3 on an EZ Flash IV Linker flash cart (as soon as it gets here, that is. I ordered it from China on Nov. 27th and it still hasn’t got here! ), and that’ll be awesome. The only problem is not save states, but my GBA SP is more portable than my laptop, so… yeah. Do you mean the option to have one game saved in the NOR (stays there until you reflash) and another with PSRAM (have to reflash each time)? Glad to see progress on this. This is such a cool game, it will be great to play through it with a more accurate translation. Psp 3000? I have that one – it can’t run emulators though. Is there any way of getting it to do so without buying a Pandora battery? Just wondering. Yes, but it depends on what firmware you are using. If you have 6.20 then you want TN-HEN C. If you have 5.03 then you would use Davee’s signed hen exploit. If you have 6.35 then you’d use liquidzigong’s 6.35 hen exploit. 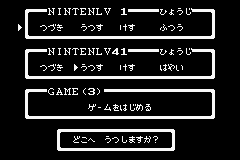 Then you’d want the emulator snestylmecm for snes emulation and gbSP for gameboy emulation. If you aren’t very good with google than if you comment back with your firmware version and I’ll give you a direct link to what you need. V.S., Slow, Norm., Fast, V.F. I went with VSlow, Slow, Norm. Fast, VFast. Looks good to me, Mato. Just bringing that up, just in case you needed some suggestions. Also Mato, I’m just curious.. Are you using the original EB0 font? Or something different? I dunno what I’m going to do with the font, I just know I don’t like the built-in font at all and will probably replace it with something.